Partnering with a diverse range of organisations and engaging experienced leading artists allow us to design and deliver programs that push the boundaries of practice and artistic outcomes in WA. DADAA is about to embark on its final year of our four-year partnership with the Perth Festival. This has been an annual program developed to advance the profile of disability arts through international artist exchanges and professional development opportunities for local artists. 2019 will see an Open Day at DADAA’s main location in the Old Fremantle Boys’ School in Fremantle. Discover some of the extraordinary work being made by artists working with us in an afternoon of screenings, showings and events. Featuring actor Julia Hales, star and creator of the Perth Festival 2018 hit You Know We Belong Together, and emerging screenwriter Tina Fielding. Festival Connect creates community-based projects that resonate with the lives of Western Australians through the exploration of ideas and the sharing of practice. In 2016, Glasgow-based performer with disability Claire Cunningham delivered two performances and ran a week-long series of workshops. In 2017, Jenny Sealey from Graeae Theatre held masterclasses and sector workshops as part of the program. In 2018 DADAA co-produced with Black Swan Theatre and Perth Festival a brand new show You Know We Belong Together. Featuring writer and actor Julia Hales (pictured above), the work was co-written by Finn O’Branagain with Artistic Director Claire Watson. 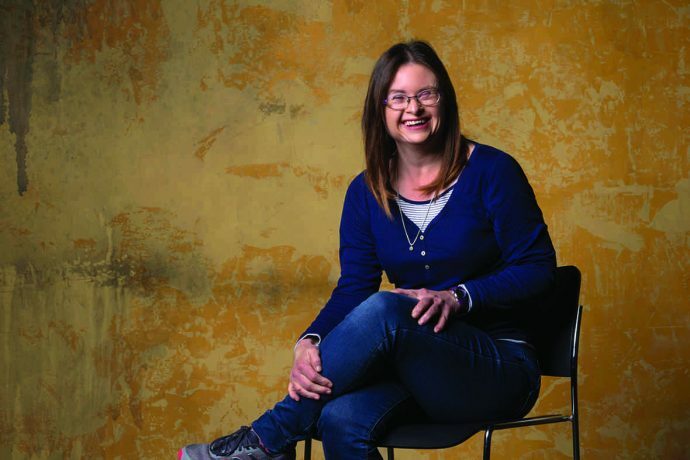 Julia is a performer and actor with Down Syndrome and her Festival show has emerged from her lifelong dream to be on the TV series Home and Away. Following sold-out and highly acclaimed performances throughout the Festival, the team is now looking ahead to touring the production.